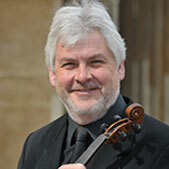 Robert Smissen is a long-time colleague of Leon Bosch at the Academy of St Martin in the Fields, where he has been principal viola for over 25 years. He has often performed and recorded as soloist with the orchestra, notably as soloist in Bosch’s 2013 album of double bass music by Dittersdorf (the composer wrote two works featuring the instruments as unlikely but happy co-soloists). He has been passionately involved with chamber music throughout his career – performing and recording with the Academy of St Martin in the Fields Chamber Ensemble and the Pro Arte piano quartet, as well as being a regular guest with the Brodsky and Allegri quartets. Recently, Robert has been invited by Julia Fischer to take part in her Julia Fischer and Friends chamber concerts. Now widely respected as a violist, he was one of the earliest [CHECK] members of the European Community Youth Orchestra and subsequently the Chamber Orchestra of Europe. He was made principal viola of the Northern Sinfonia after leaving the Guildhall School of Music and Drama, where he studied with David Takeno. He has also been invited to play in the World Orchestra for Peace under Valery Gergiev. Robert is especially interested in the repertoire for solo viola and future projects involve recordings of solo works by Ernest Krenek and Miklos Rozsa.